What do we call our medium? The most common answer is “comics.” Some would say otherwise, offering “comix,” “the ninth art,” or “sequential art.” Others abroad would say “manga” or “les bandes-dessinés.” All, however, are fraught with problems. And those problems inform how we think — and write — about this medium we so love. Know why they’re called comics? Because before they were comics, they were comic strips. As in “see you in the funny papers.” That’s why comics have the same name as the profession practiced by Jerry Seinfeld. Because a comic strip — like Peanuts — has a gag in the last panel. Now, ask yourself if this is the right name for the medium that includes Watchmen, From Hell, and Jimmy Corrigan. Many of us, habituated to this term, may well object to the thought of changing it. And perhaps, once one is educated about the medium, one no longer consciously thinks of stand-up comics and three-panel strips terminating in a boy falling down or some other such dignified maneuver. Perhaps, on the other hand, we too are victims of the associations of the word. Words have power. They connote against our will. Every time we speak or write or think the name of our beloved medium, we give voice to our own limitations as a medium, if not to our own subjection. No wonder we seem to hate ourselves so much. No wonder we champion trade paperbacks even collecting the most disposable, fluffy, insular, poorly written and poorly illustrated tripe: even the worst trade paperback emphasizes the “book” of “comic book.” No wonder so many of us hope comics will become “cool” like skateboarding or video games, as if a youth habituated to Enter the Matrix might easily segue into a pamphlet containing part six of a storyline that reveals that the underwear-clad villain seen to die four years ago actually survived through his powers, which take a paragraph to explain. Even if we do not unconsciously carry the negative implication of “comics” with us as people who love and study the medium, we can certainly expect others to. The fact remains: hearing or reading the word out of context leads to alternative meanings at best based on genre and at worst based on disposability. Comic strips are made to be thrown away, and comic — funny – movies do not win Oscars because they are seen as — and often are — fluff. That’s what we’re saying about our medium every time we say that dreaded word: Comics. And that’s what others are hearing. As an undergraduate, I talked to one of my mentors about my love for the medium. In the interest of full disclosure, he was a traditionalist, a student of the classics; on the other hand, he believed in popular culture even if he looked down on most of it, and he felt that new scholarly trends had their place, however secondary to learning the great swaths of history and art. He was an open-minded traditionalist (a description that I might also claim). His response to my explanation of comics, of its great works and of it as a medium rather than pamphlets featuring super-heroes, was to say that we needed a new word. “What you’re describing is fine,” he told me, “but it’s not comics.” And his perception of comics wouldn’t change. If that anecdote provided a “high” cultural response to the word, what follows is a popular one. While first a graduate student, I frequented a comic book shop called Campus Comics. They got occasional phone calls asking who was performing that night — or whether the show would be appropriate for children. These were not prank calls but honestly confused people — people rather disappointed to hear that a visit to Campus Comics would mean, instead of rowdy humor, the purchase of pamphlets and books featuring Superman and Spider-Man. This gave the store’s owner a good laugh, but we recognized the inherent sadness of these occurrences as we shared conversations out of love for a marginalized medium we knew to be glorious. How can we talk about how comics are capable of powerful drama when the two are so staunchly juxtaposed in the public consciousness, complete with their own sections in video (and now DVD) rental stores? Perhaps the word can be redeemed, “taken back” in the way homosexual activists have “reclaimed” the word “queer.” “We’re here, we’re queer, get used to it” has provided an exemplar for subsequent attempts to “reclaim” words. And, indeed, this is de facto the path that we’ve been following with comics: “Comics is Watchmen,” we say. Here, take Maus; “they gave a Pulitzer Prize to a comic.” But “comics are really a medium” has had less cultural penetration than “We’re here, we’re queer, we’re comics-lovers.” And, thanks to The Simpsons, comics-lovers are too often portrayed as polybag-wielding snobs one step away from Star Wars fans waiting overnight, in line in the cold, debating trivia of the films that seem to comprise their entire body of knowledge. It may be, ultimately, that “comics” can be redeemed. But the word will never lose its associations with comedy even as people forget the gag strip and disassociate comics from super-heroes. “Queer” meant odd before it meant gay, and this original definition has been preserved in queer theory, which associates homosexuals with counter-culturalists — or even equivocates between the two. But “comics” doesn’t mean odd; it means funny. And that definition of “comic” is considerably less likely to go away than “queer” meaning odd. So, it seems, we need a new word. And we’ve known it for some time. From “comix” to “sequential art,” we have tried to find one — unsuccessfully. What we’re looking to signify is the medium itself, not any particular format. Comics has expanded from the comic strip to the comic book and, more recently, the graphic novel — and now, problematically, to online comics. The name still indicates only comic strips or, perhaps, comic books. It’s like insisting upon calling novels “poetry” because they descended from poetry. What we’re looking for a term like “motion pictures” that includes film or cinema (silent and with sound), animation, television, and online movies. “Comix” was originally used as an alternative to express the avant-garde nature of 1960s underground comics (like Robert Crumb’s). The term is alive today online and in print, though almost exclusively by those privileging the black-and-white, non-super-hero inheritors of the 1960s underground tradition. The term has the advantage of keeping the pronunciation and approximate form of the dominant term for the medium, making for an easier transition, while simultaneously expressing the different meaning in its printed form — thus reinforcing the printed nature of comics instead of speech. But the term’s advantage of being closer to “comics” is also its great liability. It sounds like “comics” — and while this lets us say “comics” without any mental adjustment, our listeners still hear a word associated with sitcoms. And I’m not even sure that people wouldn’t call Campus Comix to inquire about the show. Worst of all, however, is that “comix” today smacks as yet another attempt to make something seem cool by spelling it differently in a culture in which this is all too frequent: just think of rappers names to see what I mean. Today, “comix” sounds like it wants to be used in sentences with “dawg” or “boyz.” Even in the 1960s, it was a cheap gimmick. I love to play on this fact by casually asserting that those who use the term of using it to express their love of the X-titles that lamentably dominate comics, complete with an “X” being attached to everything, e.g. the title X-Treme X-Men or Professor Xavier’s original reason for calling his team the X-Men — their “X-tra power!” This, of course, drives the indy-minded “comix”-lovers crazy, but it makes my point that such respellings are not only commonplace today but decidedly against the cultural strain the very term seeks to cultivate. Then there are more basic problems. Presumably, “comix” is both the singular and plural form. And we loose the good connotations of “book” in the already problematic exchange. So let’s abandon the term. Comics are also called “the ninth art” — a tempting possibility at first reading. This term has particular cache with intellectuals. It is used in Europe in particular and is translated into French as le neuvième art. 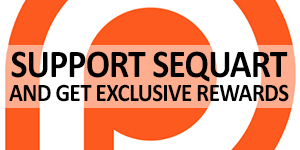 It is even the title of a fairly prominent comics website — one, like Sequart.com, with more sophisticated intentions. Some have speculated adding the world wide web as a tenth. Not to mention that “the ninth art,” while simply inaccurate in its numbering, is a generic, meaningless name. It’s like calling film / cinema “the seventh art,” as in “I went to see a movie yesterday. I really love the seventh art.” As long as no one calls the other media by their numerals, calling comics by its (arbitrary) numeral makes no sense. Manga are what the Japanese call their comics. While “manga” has become a term used in America and Europe to mean “Japanese comics” (and is thus not italicized), the term in Japan is generic. We might think about adopting this word as a generic in English, though it would create confusion today that it wouldn’t have a few decades ago, when manga was all but unknown in the U.S. Today, manga titles are routinely among the top-selling U.S. titles and comics from almost all publishers are touted as manga-influenced — or even just as manga. So the term has a meaning already, one that would be lost were it to be adopted. But there are deeper problems with using the term as a generic in the U.S. One is the irony of using a Japanese term for a medium with an independent evolution in America. Some tout the medium as somehow distinctly American, though it depends on how one defines the origins of that medium. Like “comics,” the term has problems all its own, even in Japanese. Much as “comics” signify three-panel gag strips, the term manga can be translated as “irresponsible images” — it is just as much a pejorative. “Irresponsible images” which might today connote coolness to some, but this is hardly the public face one wants for an entire medium. Along with the U.S. and Japan, France is the nation that produces the most comics: it is also the nation that accord the most high class respect to comics. Whereas comics are marginalized in the U.S., and more acceptable but still popular and (literally printed to be) disposable in Japan, comics in France are typically hardbound editions of lesser length. French comics not only have the highest production values of any nation’s comics, but they have the artwork most like high art. This would seem for many comics-loving intellectuals in the U.S. to be a promised land, and its term for comics is worth consideration here. The French call their comics les bandes-dessinés — or BD. Like “comics” and “manga,” this is itself a problematic term. Literally translated as “drawn-strips,” this invokes the comic strip rather than the comic book or graphic novel. Although a generic term for the medium, the term explicitly refers to the same horizontal comic strips recalled by the term “comics” — however much we may be grateful that the term does not intrinsically insult those strips. Nonetheless, comics have evolved into a medium embracing both comic strips and extended graphic novels — not to mention photo-comics (not dessiné) and computer-manipulated comics (not really dessiné either) — and the term les bandes-dessinés fails as a result. BD is little better, recalling the term that it abbreviates much as “comix” does. Will Eisner — known as the grand old man of American comics — responded to the problem of his medium’s name by deriving the new term “sequential art,” promulgated in his lectures and writing on the medium. This, then, was a term explicitly connoting the medium as opposed to a specific form of that medium, like comic strips. Implicitly defining comics as images arranged in deliberate sequence, the term “sequential art” is now well-known by American (and some European) literate comics readers. Eisner advocated the term “sequential art” only briefly, focusing on techniques of storytelling in comics designed for the aspiring artist. The implications of this definition were left to Scott McCloud, who explored the topic in his seminal Understanding Comics. An consideration of the medium itself and its definition, Understanding Comics offered a more thorough and intellectual consideration of the term, looking at precursors to the comics strip, preferring a broad definition and honestly admitting what it (problematically) left out (single-panel comics of the New Yorker variety), brilliantly delineating the difference between comics and film, categorizing types of panel-to-panel transitions, and speculating about issues of reader identification and the style of representation best suited to the medium. This was, without a doubt, the first mature theorist of the medium, exerting tremendous influence — and this grand accomplishment was enhanced remarkably by his theorizing in comics form, a one-up upon film theorists. If McCloud’s follow-up Reinventing Comics failed to have the same influence — offering instead speculations about new kinds of comics and advocating new forms of online comics, to which McCloud subsequently devoted himself — this does nothing to alter the accomplishment of Understanding Comics. McCloud did nothing less than cement the concept of comics as sequential art — if not the term — at the heart of literate thinking about the medium. Even if the theories are fairly sound, “sequential art” has problems as a term. Its very precision makes it feel anticeptic, like saying homo sapiens for humans. At the same time, it lacks the level of precision that we attribute to a species: as McCloud pointed out, film is (or, more precisely, “motion pictures” are) also sequential art — just with its images separated by time instead of by space. “Sequential art” is not exactly correct, strictly speaking, nor does it as a combination of a priori English words evoke a full and distinct medium. It conjures to mind various possible meanings as a result, such as a series of paintings or a serialized novel — a more pleasant alternative to invoking Saturday Night Live but nonetheless in error. Despite its flaws, “sequential art” as a term for the medium itself would seem the best of the varied alternatives available. It at least tries to evoke the medium itself — much as “motion pictures” does – even if it fails to do so precisely, and “static sequential art (also including single-panel cartoons? )” does not exactly roll off the tongue. Still, “sequential art” is better than “comics” or its derivative, “comix.” It is better than the catastrophically flawed list of artforms that results in calling comics “the ninth art.” So too is “sequential art” better than adopting the problematic foreign alternatives of “manga” or les bandes-dessinés. But “sequential art” remains inadequate, the lesser of available distortions if not evils. We need a new word. Something not already in the dictionary or a combination of words that are. A new word can mean exactly what we want it to mean. It can evoke the medium of comics rather than just comic strips or ambiguous notions like “sequential” artwork — or, worse than that, comedians. Only a new word can take in what we want it to take in without the baggage of preconceived notions. I propose a simple solution. If “sequential art” is the best, simply shorten it to “sequart.” It is a strange little word, to be sure. But it is a short two syllables — not the many of les bandes-dessinés or “sequential art.” It is as weird and strange and curious as “comix”: if it sounds odd, it hopefully provokes its questioning, which leads to a brief explanation like “the medium of comic books rather than their form, like motion pictures as a generic term is to films on celluloid and to TV — it’s static images arranged in a sequence of panels, from comic strips in newspapers to lengthy graphic novels, from Batman to obscure works experimenting with the medium itself.” The “q” has the exotic nature of the “x” in comics without being phony. And it has the word “art” in it. Sequart is the medium of The Sandman. Of Chris Ware. Of Peanuts and Doonsbury. Of McCloud’s online comics and of the stations of the cross. And if you like, of New Yorker cartoons. But not of the sequential, temporally-separated imagery of motion pictures. With “sequart,” we do not lose the terms we have come to love. We can still refer to the “comic book” and the “graphic novel.” “Comics” refers to more than one comic book or strip. “Trade paperbacks” and “graphic novellas” refer to types of graphic novels, the delineation still in debate. Those are all equally problematic terms. But they refer to format and not the medium itself. And we can keep them, warts and all. Which means keeping our familiar “comics” too. But not using it for both the pamphlet format that sequart sometimes takes and for the medium itself — the latter of which we now have a term for. Sequart may not become the dominant term, but using it makes a point about our medium. It gets us to think better about ourselves, to avoid limiting ourselves to particular types or incarnations of sequart. It makes the point that we have a medium, in an of ourselves, that warrants all the respect of any other. Although the above essay seeks to define sequart exclusive of moving images, the two media are closely connected — as Scott McCloud has pointed out. I have used “motion pictures” as the all-encompassing term for that related medium, encompassing film, digital feature “films” in theatres, animation, television broadcasts, and online animation or “films” — just as sequart takes in comic strips, comic books, trade paperbacks and graphic novel(la)s, and static online comics. But it should be pointed out that “motion pictures,” while superior to “comics” or its past alternatives, suffers the problem of also meaning feature “films” — creating confusing when using “motion pictures” as the name for the medium itself. Formats are also an issue: films refers to the celluloid used to project films in much the same way that comics refer to comical strips with a few panels of funny story — both were a past form of the medium. “Feature” films have a similar problem, designating long length — the book or graphic novel of the medium; the term “feature,” however, derives from the fact that short films preceded the “feature presentation” in movie theatres. “Theatres” even refers to the usage of dramatic theatres as places to project movies. “Cinema” is sometimes used as the generic term for the medium, though it also sometimes refers to “films” — or “features.” A highbrow term beloved by Academe, “cinema” is applied to short projected films more readily than television — it is a term for the medium when one wants it to be, and a term for “films” when one wants to make an elitist distinction. Nonetheless, the term is probably best for the medium of moving images as a whole. On the other hand, we might propose that we show the relationship between sequart and cinema by speaking and writing of cinema as “motion sequart.” After all, sequart preceded cinema: the ancestors of the two media are the same, and they did not move. Flip-books, like the one I remember from childhood with a hundred pages or so of a naked woman from the side growing more and more pregnant, are sequart. Read them a page at a time, and they remain sequart: one long, small comic book or graphic novella without scene transitions and with a single panel per page, printed only on one side of the page. Flip the pages and you turn this sequart into motion sequart: the pages occupy the same space, relatively speaking, and the eye creates the illusion of movement through the phenomenon known as “persistence of vision.” Images separated in space, as one turns page after page, become images separated by time. The same is true for celluloid. A reel of film is sequart, however boring because of its repetition. The frame is the panel. Project it at sixty frames or so per second, and you get motion sequart — as panels separated by space become frames separated by time. “Motion sequart” may never win over the film crowd any more than “sequart” entirely wins over comics-lovers, but it makes similar points. It reminds us that we are related media, our border sometimes as thin as a child running his thumb along the edge of a book. Tagged media, motion sequart, Scott McCloud, sequart, Will Eisner. Bookmark the permalink. This is a great article and distillation of what Sequart’s main purpose is: to push Sequart (the medium) into a more culturally acceptable area. Instead it tends to be a cultural ghetto of sorts. I think if we continue to discuss even what term we should use, it helps make us more conscious of this art form and how we can continue to elevate it.